I’m back! Moving is behind me, and while I still have some settling, organizing and decorating to do, I have found time to create again, and that makes me very happy. 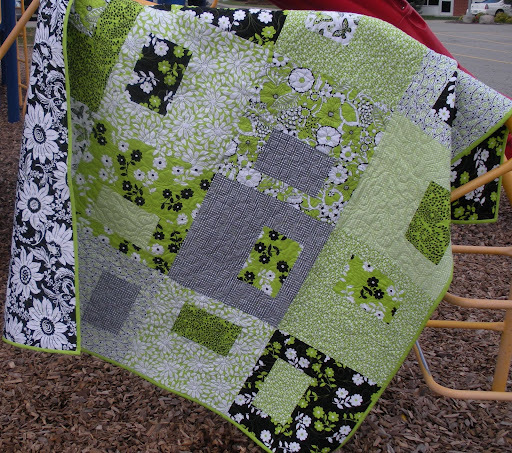 The front and binding are all from the Timeless Treasures Kiwi line of fabric, hence the name of the quilt. It’s made from Atkinson’s Designs Happy Hour book. The back is pieced, and I love it as much as the front! The only piece not from the Kiwi line is the black & white print at the right of the photo, from the Luna line by Maywood Studio. 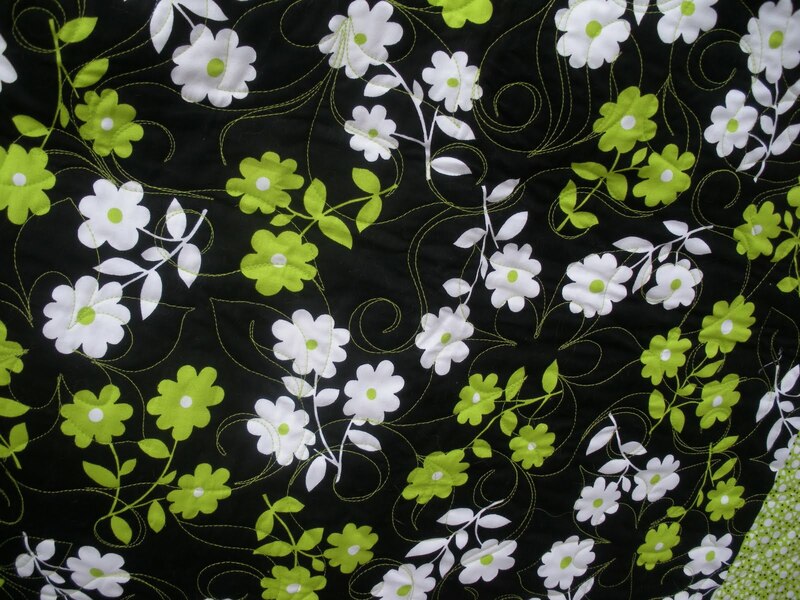 This one I will definitely be keeping for myself…it was made as a shop sample for Quilter’s Cupboard. BTW, if you come to Des Moines for the AQS show in a few weeks, be sure to stop by our shop, it’s a great quilt store with something for everyone! I also made two tops for kid quilts (finished photos to come soon, I hope! ), assisted Mom in completing two of her tops, ate too much junk food, and basically had a great, relaxing time! I have a four day overnight retreat coming up in a month…can’t wait! Stop back soon, I have a fun artsy project to share with you tomorrow! And studio pics are coming…you don’t want to miss that! this is awesome! I love those fabrics. Great work. Hi, I stopped in the shop and bought the bundle of kiwi & black. I was there on Friday instead of Saturday and it was crazy busy in there with busses of shop hoppers. I had my granddaughter sitting in a stroller and she wanted to hold the bundle of fabric. She was being so good and really quiet, and one lady touched her and said, Oh I thought she was a display. We didn't stay long, but hopefully I'll get back there during the show in Des Moines the end of the month. Very pretty and I really like the back! Very cool, Doris. I love how those fabric look in that block. And the back is gorgeous too! Great work! 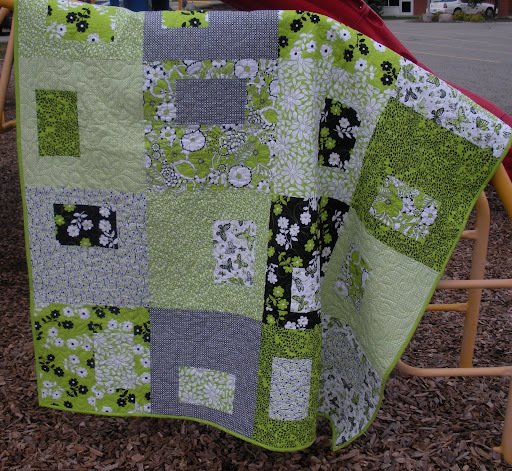 I found your blog back when you (and by you I mean we) cut the blocks for this quilt. I have been waiting to see it finished, I love the colors. Mine is still awaiting quilting, but I did post a photo of the top. Yours is great! 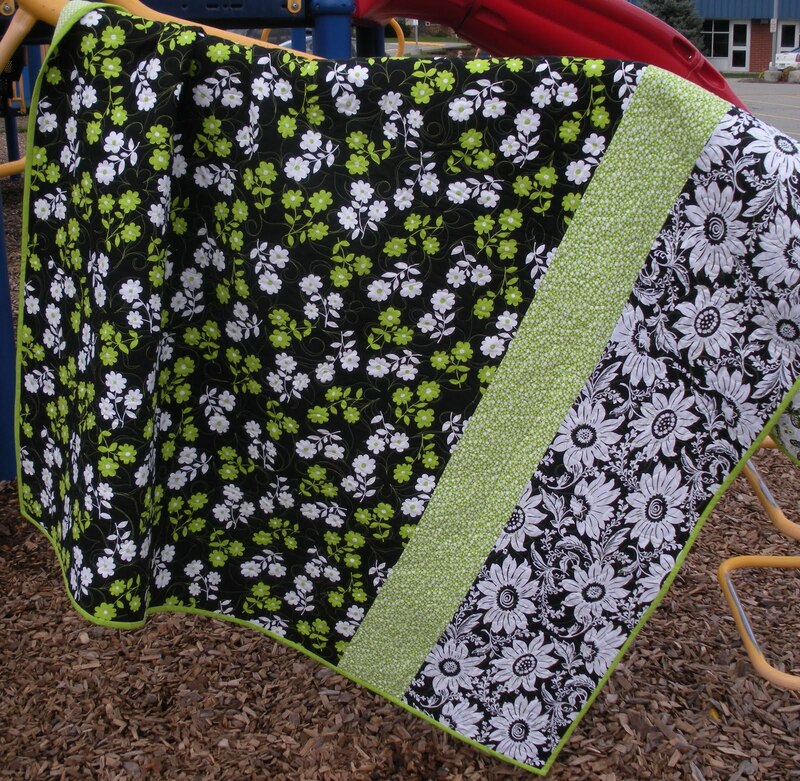 I love the colors and it really has me excited to see mine quilted! especially since I'm known as Lime Green Linda!!! Wow I love your quilt. The lime green with the black and white looks great!! this is beautiful…i've always wanted to make this pattern. That is so beautiful – I love the colour combination!